It was announced back in May that Iron Man 3 director Shane Black would be bringing pulp hero Doc Savage to the big screen in a feature film adaptation. Little has been said about the project since then, but Black has now elaborated more on the film in an interview with IGN. “Obviously in the books there’s an element of ‘goody goody’ that we like. 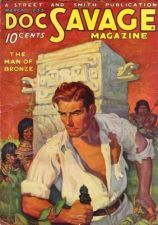 Doc Savage was the basis essentially for Superman because his name is Clark, he has a fortress of solitude, and ‘oh Superman has the same thing, that’s odd.’ But that kind of perfect hero who never makes mistakes him great to a point and that type of adventure and the pulp it represents has been so immitated. Raiders of the Lost Ark is essentially a child of Doc Savage. But we needed something more. The subject then changed to casting, and Black explains why there hasn’t been much talk about casting since the announcement. Black will direct the Doc Savage film for Sony Pictures from a script he has co-written with Anthony Bagarozzi and Charles Mondry. Neal H. Moritz is producing the project with Ori Marmur through his Original Film banner. Michael Uslan will also serve as a producer on the film. No release date is currently set.